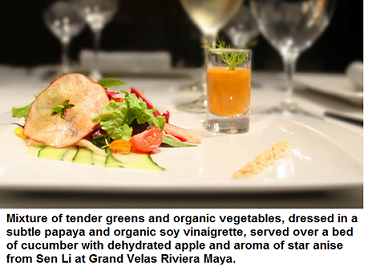 The "Beyond All-Inclusive, Beyond All-Compare" Grand Velas Resorts in Riviera Maya and Riviera Nayarit, known for outstanding fine dining, are now offering menus with gluten free, organic and vegetarian options. Travelers with food allergies or special food preferences can visit the resorts worry free, as there are plenty of gourmet and in-suite service options for all guests. Seven restaurants at Grand Velas Riviera Maya serve gluten free and organic dishes, each clearly marked on the restaurants' regular menus. This includes four of the resort's gourmet dining venues including Piaf, serving French cuisine and Frida, serving traditional Mexican cuisine, each the recipient of a AAA Four Diamond Award. The Asian option, Sen Li, as well as Lucca, serving Italian-Mediterranean cuisine also offer gluten free and organic items marked on the menu. Vegetarian dishes can be prepared at any of the gourmet restaurants on request. While not marked specifically on the 24-hour ensuite service menu, gluten free, organic and vegetarian items can also be prepared on request at any time. All gourmet restaurants at Grand Velas Riviera Nayarit have gluten free and organic food icons that guests can identify while dining. This includes the resort's AAA Four Diamond Piaf, Frida and Lucca gourmet restaurants. 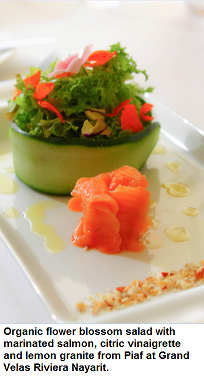 While designated specialty items are not marked on the menus at daytime restaurants, Azul and Selva del Mar, or on the 24-hour ensute service menu, the resort's Chefs can work around any special food allergies, as well as prepare gluten free, organic and vegetarian appetizers, entrees and desserts. Grand Velas Resorts' all-inclusive rates include luxury suite accommodations, a la carte gourmet meals at a choice of specialty restaurants, premium branded beverages, 24-hour in-suite service, fitness center, taxes and gratuities, and more. For reservations or more information, please contact Velas Resorts at 1-888-407-4869, email reservations@velasresorts.com or visit www.velasresorts.com. Grand Velas Riviera Nayarit, an all-suites and spa resort located just 15 minutes north of Puerto Vallarta on Banderas Bay, is a member of The Leading Hotels of the World and a recipient of the AAA Five-Diamond Award. The resort features 267 spacious ocean-view suites. The crown jewel of the resort and a member of Leading Spas of the World, the Spa at Grand Velas features 20 treatment rooms, over 60 spa treatments, gym and exercise room, spa boutique and beauty salon. The family-friendly resort also offers tiered three-temperature infinity pools, tennis court, 25,321 total sq feet of meeting space and a Kids Club. Nearby are championship golf courses, numerous options for soft adventure, and the charming town of Puerto Vallarta with its many shops, art galleries and nightlife. Grand Velas Riviera Nayarit has received numerous accolades within the industry, most recently named one of Forbes 10 Coolest All-Inclusive Resorts, as well as a 2013 Best Hotel In Mexico and the #1 Hotel in Puerto Vallarta by U.S. News & World Report.